While noodling about on 'tinerweb this morning I discovered that Lawrence Precision, who are famous for their titanium moderators also make this 2.3 Kg mountain rifle. In order to create a unique Rifle, we have started from the ground up. 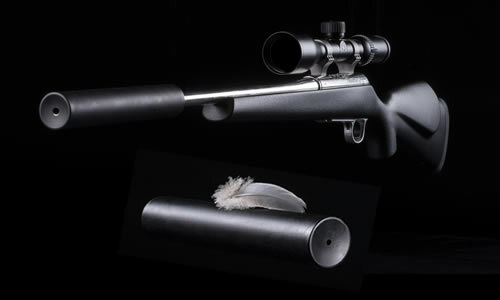 Using our own unique super light receiver, built from High Strength Aerospace Grade Titanium, our super strong lightweight Carbon fibre stock, Match grade barrel and trigger, we have created an ultra light and accurate rifle. When incorporated with our Titanium Sound Moderators and Scope Mounts, this produces a unique ultra light winning combination. The tantalising combination of exquisite machining, Titanium, and Carbon Fibre really does it for me. This is a 100% custom rifle, not an assembly of parts, all the work of one man. Let us not discuss tawdry things such as the price and four month build time. I've also seen a .308, for me its the magic of the 6-7mm range. With such a light rifle I'm veering towards the .243 BUT at 100gr it's at the top of its bullet weight range, whereas the other two are at the bottom of their's. Obviously there are lots of other factors to be considered. What would you choose and why?